This hiking granola bar review revisits a tried and true approach to getting enough carbohydrates on a hike. Five decades ago (back in the days of hippies a.k.a. granola munchers) I was making my own granola and packing it up as trail snacks. So after all these years, I thought I was over granola. 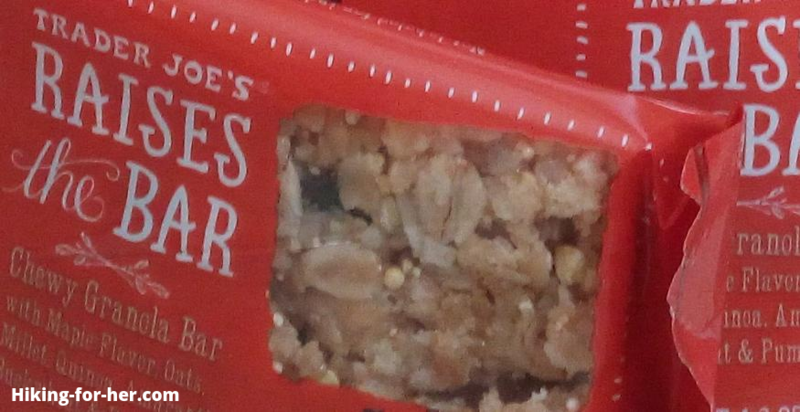 But then I tasted a Trader Joe's Raises The Bar maple bar, and I just had to write this hiking granola bar review. As with every review Hiking For Her shares with you, you need to know my biases. 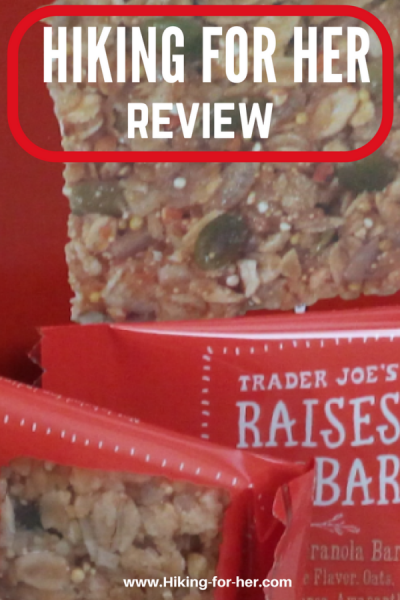 In this hiking granola bar review, the only motivation was to put inexpensive yet tasty and convenient hiking snacks into your trail food repertoire. No one paid me to write it. No one gave me these bars. If you purchase some of these granola goodness using this link, Hiking For Her receives a small percentage of your purchase price but you pay nothing extra. WooHoo! All around goodness for everyone! Now let's get to all of the reasons I love these bars. If you've been reading up on your hiking nutrition, you know how important it is to keep a steady supply of glucose flowing to your muscles and organs as you hike. If you haven't had a chance to think about why hiking food is important, I've got you covered right here. Nice mix of grain sources: brown rice, oats, buckwheat, millet, amaranth, and quinoa! See all of that goodness peeking out of the clever little window? It's calling your name! If you're watching your cholesterol levels, you're in luck: these have none. Sodium levels are modest: 80 milligrams (3% of your daily allotment). Most hikers need the sodium to replenish what they lose in sweat, anyway. Now let's look at something every bit as important as the nutritional punch these bars pack. You are probably already on to me here. I would never recommend a trail snack that doesn't taste delicious! I wish I could adequately describe the chewy goodness of this bar. A bit of sweetness with the distinct taste of maple syrup is what I like most. But I also enjoy the crunchiness from the grains and pumpkin seeds. Good flavor, great mouth feel, takes awhile to chew so it's satisfying! I am fortunate to live in a city with numerous Trader Joe's grocery stores. But maybe you've never heard of them. They are renowned for their amazing variety of food AND their inexpensive prices. These bars come 5 to a box, and for about $7 on line, that works out to around $1.40 per bar. That's a low price for a trail bar that's well put together from a nutritional and taste perspective! 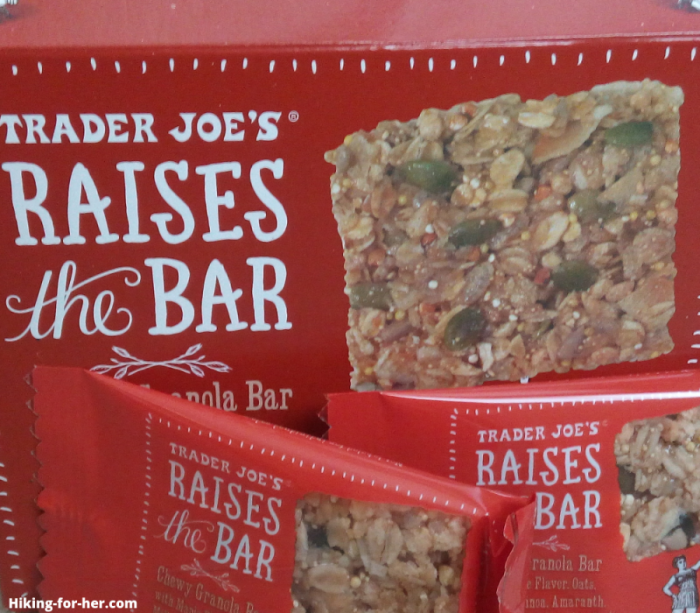 A box of these granola bars will keep you fueled on your next backpacking trip! It depends on your hiking style! If you prefer organic hiking food, read this. If you'd rather skip the grains and go paleo, read this. If you're not a fan of maple, you won't like these bars. You have more flavor choices! Although I'm a big fan of maple flavor, I'm also a chocolate lover. 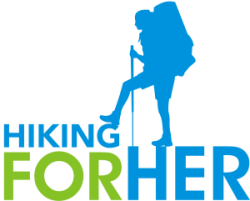 Read my thoughts about the best hiking chocolate before you take your next hike. 5 maple bars, and 5 dark chocolate chunk bars. No way to go wrong there! Thanks for reading this hiking granola bar review. It makes me happy to share something so simple and so delicious for your trail time!